Match.com is one of the oldest but most successful players in the game of online dating. The driving force behind its success is the fact that it never stops evolving inters of technology and innovation. It is loaded with some of the best features the internet dating community can offer and has a huge user base. That and the fact that it is one of the few platforms that offer international matchmaking services makes Match.com one of the world’s most successful online dating platform. The free Match.com subscription plan allows newcomers to test the waters before buying any subscription plan. On this free membership plan, you can browse through an extensive list of possible matches or even filter and narrow down the list using physical traits and lifestyle choices as the basis of your search. As a non-paying member, you can also receive notifications of interest usually in form of winks and emails from other members but you have to subscribe to a paid membership plan to view these notifications and send back replies. On your first visit to the Match.com dating community, you’re welcomed with a direct-to-the-point sign-up form that covers your personal information. The information you are required to provide include birth date, email, country of residence, zip code, your gender and the gender of the partner you’re looking for be it a man, a woman or both. That and of course you’ll have to choose a username of your liking, but most importantly one that ideally conceals your identity for privacy and security purposes. Once you’re done with that part, you will then come across a list of several questions, and in conclusion, the “about me section” where you get to write little about yourself. Your account is all set. From there, you are whisked off to the subscription payment page. This can be somewhat confusing especially because you don’t have to buy any premium plan immediately after registration. The good news is that you can close the subscription page and take a tour around the site to determine whether it’s what you’re looking for. On your first log-in, you’ll discover a very spontaneous interface, loaded with tons of neatly organized features. This makes the site easy to use even for the less tech-savvy users. To top it all, the site is mobile friendly and has a mobile app for on-the-go use. The site navigation using a mobile device is way faster and simpler. An example is the Daily 6 feature. Sometimes you may get too busy to search and browse through the extensive list of profiles available. It is at this point that the Daily 6 comes to your rescue. Based on your profile preferences, it provides you with a list of 6 different profiles each day. Once you have viewed all the 6 possible matches and decided none of them is a match, you can either move to manually searching other profiles or wait until the next day for a new set of 6 more possible matches. The Quiz is another impressive feature. It allows you to choose from a list of up to twenty pre-written questions which your profile visitors can view and answer (answering is optional). This set of questions is devised to help you get an overview of one’s character, in a fun and no-invasive way. The search feature for this site is well crafted to give you exactly what you’re looking for. You can opt to go for the quick search option or the advanced search option. In the quick search option, all you need to do is enter age, distance, and postcode then click the search button. On the other hand, the advanced search option allows you to be choosier. The choices here are close to limitless. You can even opt to search for members using their birth dates. The Contact Filter is another feature that comes in handy. This feature simply gives you the power to decide who can and who cannot contact you (on the site). This means you can choose to block members who are over ten years older than you from contacting you. These are just some of the cool features Match.com has in store for you. Very popular and very largely used especially in the UK. Offers International services and multilingual dialects. Offers affordable monthly subscription plans. The automatic re-billing system is somehow inconvenient. A one-month membership plan is quite expensive. At Match.com, your privacy is a priority. Features like the photo list of members who view your profile and the blocking mechanism allows you to customize your privacy. The site also offers a lot of helpful tips including safety tips for a smooth online dating experience. Due to its modern user interface and the well-organized features, the site navigation is superb. The Match.com dating community is quite supportive of new members and the customer care support team unmatched. Payments can be made using Credit Card / Charge Card / Check Card / Debit Card, Paypal and Money Order. 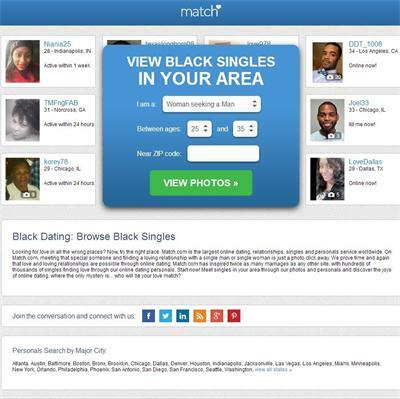 Match.com offers its users the latest technological features required to make their online dating experience a success. Its popularity and the fact that it’s widely used in different countries increases one’s chances of getting a perfect match. Match.com is your best bet when it comes to the online dating arena. How Black People Meet on Tinder App?